ALL SET – ROUND THE ISLAND RACE IN ASSOCIATION WITH CLOUDY BAY. After some tough and exciting racing at last weekend’s RORC National Championship the fast 40+ Class are holding another regatta over next weekend including taking part in the Round the Island Race. At last weekend’s regatta, it was Johnny Vincent’s British KER40+ Pace that won the 2017 FAST40+ National Championship, holding onto the lead after a terrific battle in the last race of the regatta. In Race 8, Pace was down in fifth place at the first top mark, but gybed away early to make up enough places to win the regatta. Cowes resident Peter Morton’s brand new British Carkeek Mk3 Girls on Film was second, just two points behind. Kiwi Mark Rijkse’s Reichel Pugh designed 42 South was third with 42 South being the most improved performer on the circuit for the 2017 season. Meanwhile within the rest of the RORC fleet it was a near perfect scoreline for Giovanni Belgrano’s 1939 classic yacht Whooper which was crowned 2017 champion at the Royal Ocean Racing Club’s IRC Nationals. During the event Whooper, a classic Laurent Giles sloop that was previously IRC National Champion in 2004, scored six bullets, a fourth and a discardable DNF in the final race. Whooper is taking part in the RTI race in IRC Division 3B. Following racing on Friday and Saturday, Sunday’s two windward-leeward races were held on the Solent in similar brisk southwesterlies to the first two days. This year’s event may not have been an ‘all-round test’ weather-wise, but was extremely challenging in terms of preparation and boat handling. Racing for the FAST40+ Class continues next weekend, 30th June/1st July, with Round 2 of the FAST40+ Race Circuit, consisting of one day of Windward Leeward racing, followed by the 50 nautical mile course Round the Island Race. With entries now closed at 1342 this year’s race looks to be as good as ever and for Island residents and visitors there are numerous viewing spots, although remember that 5.30am start! At the start, all the boats cross the start line at Cowes in eleven separate groups, starting every 10 minutes from 0530 until 0710 and heading in a westerly direction towards Yarmouth. Boats pass round the Needles Lighthouse, along the south-west coast of the Island to St. Catherine’s Point and then across Sandown Bay to round the Bembridge Ledge Buoy. All the fleet then makes its way either side of No Man’s Land Fort and across Osborne Bay to the finish line back at Cowes. With Cloudy Bay announced as the Presenting Sponsor, the race includes amongst its entries the Farr 52 Bob, entered as Bob by Cloudy Bay, skippered by Stephen Durkin. Amongst the crew this year is Cloudy Bay Brand Ambassador, adventurer and storyteller, Ben Fogle. Another famous adventurer is the man who discovered the source of the Nile in Rwanda in 2005 under the most horrendous of circumstances, Neil McGrigor from Lymington, Hampshire. He also has several other high-profile expeditions under his belt, usually in a rigid inflatable boat but on 1st July will be racing his J/109 BOO, a 35ft cruiser/racer, with nine members of his family on board aged from 16 years up. This year’s Round the Island will see the maiden voyage for both the yacht Mr. Blue Sky, a Hanse 385 and its crew, a mixed bag of people including a Day Skipper, Coastal Skipper and a Yachtmaster. Also on board they have ex-Gloucestershire & England off spinner, & Chairman of Cricket for The Lords Taveners, Martyn Ball, for his very first taste of yacht racing. Returning to the UK fast foot from The America’s Cup in Bermuda is David ‘Freddie’ Carr. ‘Freddie’ has taken part in the RTI several times before especially remembering the X40 in 2011 as a highlight. 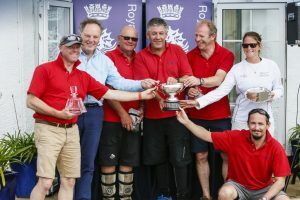 As well as trophies for individual boats the race also features team competitions for boats from affiliated yacht Clubs. Now for that important weather; Predicted are winds NNW 10-15 at the start backing to WNW 10-15 at noon. As the race’s official Technical Partner, Raymarine will play a key role in providing competitors with essential weather updates ahead of the event, culminating with a live Weather Briefing and pre-race strategy on the race eve. For this year’s Weather Briefing, Raymarine has enlisted the expertise of the British Sailing Team’s meteorologist, Simon Rowell who will share his tactical advice and present the final pre-race weather strategy.